But there are new companies springing up across the Lexington area all the time, and this begs an important question for job searchers: which companies are the best for employees to work for? 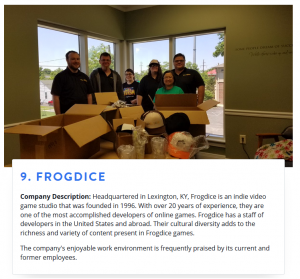 We were curious, so, we hand-curated a list of the best companies to work for headquartered in and around Lexington, KY using data on salaries, company financial health, and employee diversity. 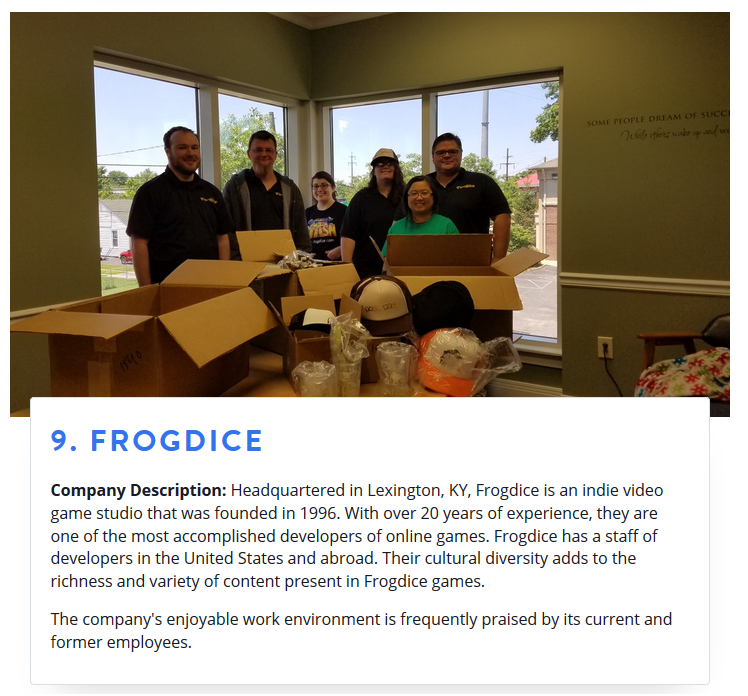 Lexington named 6th best city in the US to be a game developer, and Frogdice was one of two local studios mentioned! +50% to all XP – combat, crafting, gathering, farming, trapping. TIME: 10pm EDT – ??? Party Favor: 18 slot pack for everyone online at a random time during the party. This new system allows players of any level/level-range to group together. Have fun! Your character’s Ability Power (AP) is boosted by what % your Character Level is below Party Level. (Maximum Boost: +300%). All abilities, attacks, and heals use AP to calculate the magnitude of effectiveness. Party level is 150% higher than the sidekick. Sidekick’s AP is boosted +150%. Character Level is 25% that of the Party Level. Sidekick’s do not receive additional class abilities. The boosts happen behind the scenes – you will not see them on your character sheet. We are excited to announce that STASH was chosen as a winner of Taco Bell’s 2017 “Feed the Beta” best indie game competition! But the most exciting part of this is the help from Taco Bell promoting Stash and our launch. 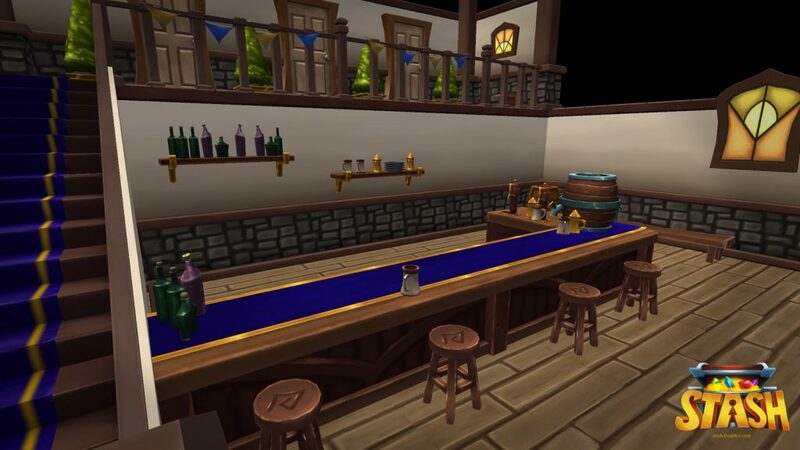 We have access to a private forum with a group of gaming media and marketing experts they have gathered to help the winners promote their games. This includes media, twitch streamers, and youtubers with some pretty big audiences. It is exciting and validating to have STASH chosen as a top indie game. The help they will give us promoting the game will really be huge. The toughest thing about indie game development is getting the word out. This should be a big boost in that area. Visiting other BOOs, Titles, More Newspapers, Leaderboard Rewards, and more! Tons of bug fixes. RSI, world encounters, and more!